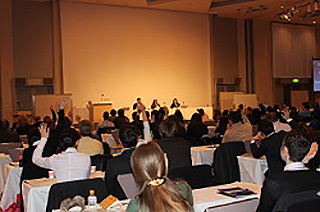 The After JET Conference (AJC) is held in the Greater Tokyo area each year in February or March. By providing information about finding employment after JET to all participants who are concerned about their post-JET careers, CLAIR aims to enrich the lives of JET participants after they leave the JET Programme. In addition to information about job-hunting in JET participants’ home countries and in Japan, seminar topics also cover pursuing further education, how to deal with reverse culture shock, and other aspects of life after JET. Participants can also receive a 20-minute personal consultation with professionals working in a wide range of career fields both in Japan and abroad (advance registration required). Many of the presentation materials from the latest conferences will be posted to this page for those JET Programme participants who cannot attend AJC (see below). Unlike other conferences, attendance at AJC is optional. There is no fee to attend the conference, but travel expenses to and from the conference venue, accommodation, and other related fees must be borne by the JET participant. JET participants must also first confirm that the conference does not interfere with their work duties and obtain permission from their contracting organisation supervisor before registering to attend. In general, attendance is limited to participants who are leaving the JET Programme (participants who have not requested reappointment). The 2019 After JET Conference will be held on 28 February at Tokyo Bay Makuhari Hall.